Beautifully engraved specimen from the Hartford Times, Incorporated printed in 1928. This historic document was printed by Northern Bank Note Company and has an ornate border around it with the company'same on top center. This item has the printed signatures of the Company's President and Secretary and is over 68 years old. 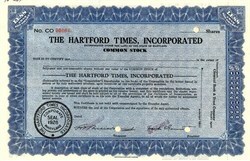 Hartford was served by two daily newspapers: the morning Hartford Courant and the afternoon Hartford Times. The Times published from 1817 until 1976.